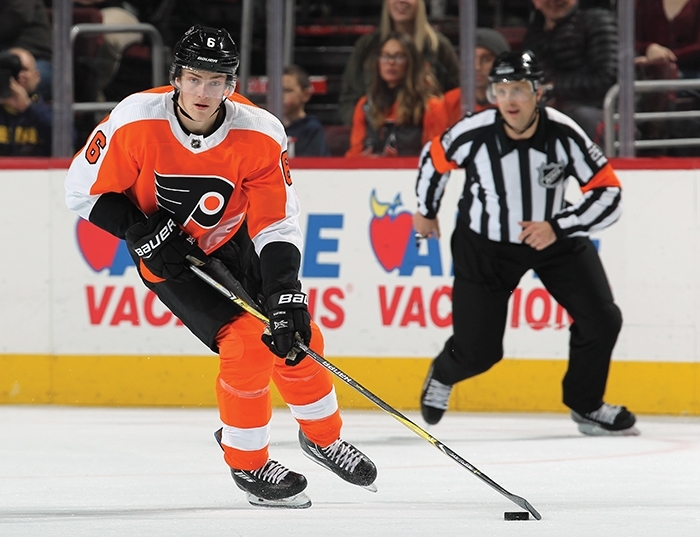 Travis Sanheim in action with the Philadelphia Flyers. Like most small town kids on the prairies, Elkhorn’s Travis Sanheim has had a pair of skates strapped onto his feet since he was four years old. And like many young kids growing up playing hockey in small town rinks, Sanheim wanted to be an NHL player one day. Today, in his rookie season with the Philadelphia Flyers, Sanheim can say that hockey dream has come true. The 21-year-old defenseman has played 34 games with the Flyers, earning a goal and four assists so far in his inaugural season. Sanheim says he “didn’t have any other plan made,” and it’s a good thing he didn’t, because from his earliest days on skates at the Elkhorn rink he eventually rose through the ranks to reach the NHL. “When I first started to play I was four or five years old. I think I started skating at around three. I was on the ice early,” he says. Two people in Elkhorn were Sanheim’s influences—his dad and Dennis Kyle. “My dad actually coached me until about Peewee. He was the assistant coach and we had another guy that helped out as well,” says Sanheim. “The other guy was Dennis Kyle. I played with his son and he is one of my close friends that I have grown up with my whole life. He coached me all the way through my minor hockey with my dad. Like all kids who want to aspire to hockey greatness one day, Sanheim had his pro hockey idols as well. Sanheim played two seasons with the regional Yellowhead Midget AAA Chiefs before joining the Calgary Hitmen in the WHL as a 17-year-old. He played three seasons with the Hitmen. He was also part of Canada West at the 2013 World U-17 Hockey Challenge. In 2014 Sanheim led all defensemen in scoring at the 2014 IIHF World U18 Championships where he helped Canada win bronze. He also played for Canada in the 2016 World Junior Ice Hockey championships. In 2014, he was a first-round draft pick, 17th overall, of the Philadelphia Flyers. He played his first full pro hockey season in 2016-17, accumulating 10 goals and 37 points in 76 games for the AHL’s Leigh Valley Phantoms, the top affiliate of the Flyers. “It’s been a long process and a long journey but I’ve loved every step of the way,” says Sanheim. “I think something that has gotten me to where I am today is how much I love the game. I was determined and I knew what I wanted to do when I grew up and I think I just had that mindset that nobody was going to stop me. I was going to get there, I was going to find a way and then just work hard every day to try to get to that position. This season, Sanheim went to the Flyers training camp bound and determined to make the roster. What did the Flyers see that they liked? Sanheim stepped onto his first NHL ice on October 5 during a road game against the LA Kings. What is it like for a young hockey player stepping on the ice to play his first NHL game? Sanheim says it takes time for a new NHLer to get over the glow. “My first game I would say pretty well halfway through the game during those shifts I was going out there for, you still can’t believe that you’re in the NHL and you’re lining up against guys you grew up idolizing and watching. And now you’ve got to go and battle and compete against these guys. Sanheim says he’s glad he got the year of pro hockey in the year before to help him adjust to the pace of playing at that level. “Playing pro the year before I was able to play against men, and coming from Junior I wasn’t able to do that there. So playing against men the year before definitely helped me come into the season. Sanheim says it takes some time to adjust to everything about the NHL. “I think early on, the first probably 10 to 15 games, you are playing in new rinks and against different teams. I remember one game, it was my second game, it was in Nashville, and it was their home opener and obviously they had just lost in the Stanley Cup finals so they had their banner raising for the Western Conference Finals. The place is just going off with how crazy the fans were. As a new player in the league, Sanheim says his goal is to keep on learning. “I’m still trying to learn every day and get better every day,” he says. It is a process, especially as a young D-man in this league. I think every day I’m getting better and better. Just practicing against Claude Giroux and Jakub Voracek and guys of that skill level, it’s hard not to get better when you’re playing one-on-ones against those guys and practicing. It just makes you that much better for the games. “Over the course of the season I’d say that there’s definitely been progress and hopefully towards the second half I can make the other jump forward. “I’m much more confident than early on. I think now I’m more confident with my playing ability. When I get the puck it feels like maybe I have a little bit more time to make plays and read the ice and play the game I want to play out there. Sanheim says his parents and his community continue to enthusiastically support his success. “My whole career my family has been supportive, whether it’s my siblings or playing with my brother (Taylor) all the way up into junior. My sisters as well have been just as supportive. My family tries to come and watch. When I played in Winnipeg, not only them but pretty much my whole community was there. I think there were 50 or 60 people coming from Elkhorn to the game in Winnipeg, if not more. “My parents try and come down here as often as they can. I think they’ve already caught six to eight games which is pretty good considering how many games we’ve played this year. “Growing up they’ve all been supportive. I wouldn’t be where I am today without the support of those guys, whether it’s driving me to games or buying me hockey equipment and all the sacrifices they’ve all made. “It’s pretty cool to be able to play at this level. I went home for Christmas and just seeing people there and how happy and supportive those guys are is great. They can’t believe that somebody from their local town’s playing in the NHL. You kind of got the whole town support and it has been awesome.